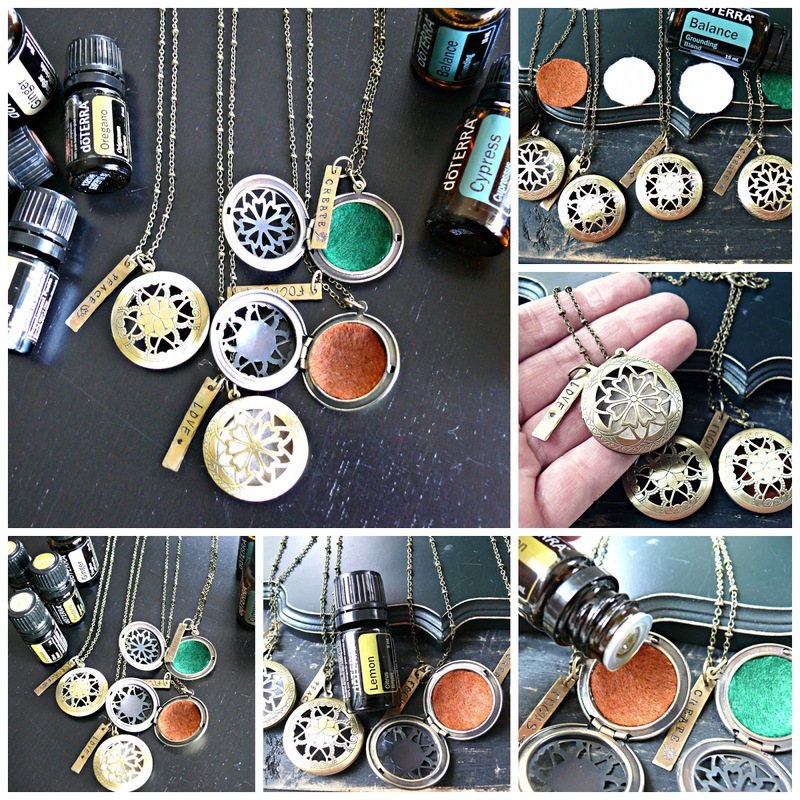 Today's post is something I have been wanting to share with you for quite some time, I wanted to share a few things about essential oils and gift you with one of my personalized oil difuser lockets. I am a Doterra oil user, I swear by these oils and use them every day in my life. Oils are a natural way to treat any medical ailments you may have. From simple bug bites, to allergies and more serious complex diseases. I have been using them for four years now, there are a few that I seriously can not live without. For example the "Digest Zen" is something I have been using the most. I got really sick last year due to a food type of poising that had morphed into a post infectious disease in my stomach. I had to change my entire diet and eliminate certain foods. This oil I carry in a bottle and use on my stomach when I'm in pain or discomfort and its wonderful! Last night I came home and was carrying a lot of stress and was experiencing a panic attack, I diffused into the air some lavender and lemon and it helped bring me back down. There are seriously so many uses, I love that I use these on my son as well, he gets a little mixed in a hair water bottle to help with focusing with his ADHD. I use them for different things when he is sick, with fever etc. The list goes on. I have a reference book that I go to anytime I need help, it suggest which oils to take and how to take them, you can take by mouth as they are 100% pure and safe. You can use on your body with a carrier oil or diffuse into the air. I have done all. I also purchased a wooden oil box holder to carry my oils in, this picture is a little outdated and since then I had to have one custom made because my oils have tripled! So being a small business owner, I was thinking how wonderful it would be to bring together my love for oils and my love for jewelry and hand stamping together! I came up with these very affordable brass oils lockets, that have felt in the insides. Its there you place just a few drops of oil onto and wear it around your neck. This is really good for trips, stressful events, etc. When you need the oil on the go! The best part about this necklace is the fact that you can also add in a personalized tag!! So its two in one. You also get to pick the size of your chain and the color of the felt. If your interested in these lockets they can be found in my shop Yourcharmedlife Inc. I am offering my readers and followers 20% off these lockets only, by using coupon code "essential" at checkout for that amazing discount! I do, sort of I guess. I have really terrible skin, so I only buy soap made with essential oils. I use oils purely for aromatherapy, either in cleaning products or in my oil diffuser. An oil locket seems like a cool way to use aromatherapy while on the go! I do not use oils. This is something different that I just noticed of yours. Really cool idea! I've used a oil diffuser before if that is similar. Not really sure though! I don't use oils but I have wanted to try them for a while now! i use them for all kinds of aromatherapy. Not really, i've wanted to, just haven't been really sure what to try. I use them for aromatherapy in my oil diffuser. We also apply them on our feet for colds and fevers. I have never used oils but would like to try them. I do use oil. My most used are lemon to add for cleaning. Lavender for relaxation and peppermint for stomach ailments along with headaches. I don't use oils often, but would if I won one of your lockets! I do not use oils, but I've been wanting to try them. I don't use them that often. I have used them to make candles. I haven't used essential oils yet but it's been recommended to me by my therapist, she suggested them for better sleep and to use for calming purposes. I've heard lavender is great for both of these reasons. Yes, I use oils. I use them in cleaning products and I also use them as aromatherapy. I trying, and learning more as I go.